TRIBUTE: The announcement last week of Ajith Samaranayake's death took me by surprise, and created a great sense of melancholia. Oddly enough, knowing nothing of the illness, I had been thinking of him the night before, when I was looking through a copy of the first New Lankan Review, the journal I had begun in 1983. Amongst other things, I had been looking for semi-colons, an enterprise he would have found immensely amusing, given too the reason: the only competency with regard to the mechanics of English writing that the NIE in its wisdom has highlighted for next year's Grade 10 students is that they should use 'semi colon appropriately'. He was probably the only practising journalist who used such marks of punctuation creatively, but he would have dismissed such skills in his usual deprecating fashion. The 1983 journal in which he figured began with an Arts Diary, which in those days I thought was my main field of interest. I had made friends with Ajith because, quite often in those days, I used to present a programme called 'Arts Scene' for the then English service of the SLBC. This was meant to include interviews with guest speakers, and I had found Ajith a wonderful exponent of Sinhala theatre, and much else besides. I had discovered him when, depressed about the appalling content and writing of most pieces in English newspapers, I had suddenly found erudite, elegant and excellent pieces under his byline in the, I think Wednesday and Culture Page. I hasten to add that there were of course still some good English language journalists, and not only amongst the more seasoned writers, but no one else knew quite as much about international social and cultural trends whilst also being deeply versed in local custom. I said as much to him when I first asked him to appear on my programme, and I think he was pleased. Shy and self-effacing, though he was always confident about what he knew, he had not I think received such unreserved praise in the hierarchichal envious world into which he had entered. His Editor had after all simply told me he was a quiet young man, without the active enthusiasm I felt such an intellect and such talent demanded. We remained good friends though we met rarely. I was flattered when he suddenly turned up at home about five years ago to ask for a reference for a scholarship. He said, and I had no doubt whatsoever that it was true, that he was not interested in the scholarship himself but his wife was keen that he apply. Being totally appreciative, as he always was, about her deep concern for him, while also as always thinking it unnecessary, he had agreed to apply, but left it till the last minute. Contrary to her advice, he had not gone to Sarath Amunugama, whose recommendation would doubtless have helped immeasurably. I suspect he came to me instead because he wanted to fail. He would have been miserable had he had to spend any protracted period outside Sri Lanka. This distinguished him, though he was always quick to point out that we belonged to the same generation (he was just three months younger than me) and shared much of the same intellectual baggage. However, unlike me and Chanaka Amaratunga and Richard de Zoysa, whom he lumped together with me though they were actually much younger, Ajith came from Kandy and was much more involved in local experiences and aspirations than we could have been. This indeed distinguished him also from his peers in the world of journalism, Vijitha Yapa and Gamini Weerakoon who were little older, Sinha Ratnatunga who was little younger. Emphatically denizens of Colombo, of the Royal-Thomian network, they had bought thoroughly into the ideals of the new Jayewardene regime, even though as it happened they are all clearsighted enough to have realized how badly it failed to live up to those ideals. They therefore would never have gone, back or otherwise, into the State media, even if the government in power was to their taste. Ajith, after his seminal stint at the Island, did go back when what he saw as a more socially conscious government came into power. Understandably enough, given the monolithic mentality that all our politicians now possess and indeed privilege, he was soon enough disillusioned. His last few years at Lake House were sad, even though in the last year he was given a paper of his own that he might have developed into the high level intellectual weekly, like the New Statesman, that had been the focus of his admiration when he first took to journalism in the seventies. But it was too late. There is no audience for thinkpieces based on the wide range of knowledge and conceptualization possessed by someone as widely read as the sixties made possible. Though he was trying to gather an erudite team around him, no one else - and this applies to people of his own generation as well - could write with such a depth of knowledge and such subtle skill with language. 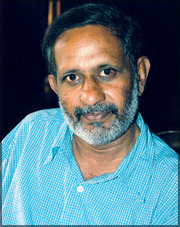 Ajith stood in the tradition of journalists such as Tarzie Vittachi and Mervyn de Silva, Jayantha Padmanabha and A. J. Gunawardena and Regi Siriwardena, who could interpret universal ideas to Sri Lankan readers and present Sri Lankan experiences in terms of the still sad music of humanity. No longer will we find, even amongst the brightest and most committed of our journalists, what might be termed the wide-ranging renaissance mentality of this breed. I don't think those who remain will grudge my saying that, as I viewed his body at the Funeral Parlour last Friday, I was reminded of a chilling line from the film of the Lord of the Rings. Ajith would have appreciated the semi-colon. A colon or a full stop would not have suggested that we cannot swim against the tide.